....the deck guy still hasn't gotten started. Hopefully he'll get to us soon, since our weather has been beautiful and his schedule should be right on track. ....and whatta coinkydink! 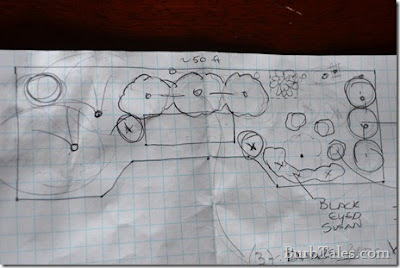 We met with a landscape designer to get ideas for said privacy! One of our local nurseries was offering 30 minute sessions with a designer for a $25 donation to the American Cancer Society. What a great way to get a little professional input for not much money! We really like the designer's ideas, and we'll be implementing them as we can. 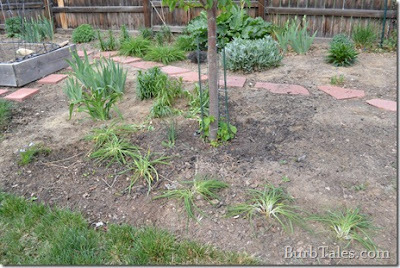 But in order to bring in new (expensive) plants, I need a good plan in place to help them get established. This includes transplanting the existing plants, amending the soil as we go, and finding a safe and effective plant food for both the transplants and the new trees and shrubs. Here's a grouping of recent transplants (some of which have been dug up by the neighbor's dog.) Obviously, they need some time (and help?) to get re-established! I've been thinking a lot about the chemicals I use in our yard, and now that we have a baby and plans for these new shrubs and trees, I'd like to get away from the conventional, chemical fertilizers (Miracle Gro, anyone?) and cheapy soils. Side note - I got BLASTED on an online gardening forum one day for asking for suggestions on fertilizer. Apparently the use of "fertilizer" is a HOT BUTTON for a lot of folks. Instead, organic "plant food" seems to be the better route. Honestly, I'm pretty uneducated about the whole chemical-fertilizer thing, but if there were good alternatives I actually knew about (other than compost - already doing that), I'd reach for those instead. Whitney Farms has a line of organic plant food and organic soil. I recently learned about these guys, and although I haven't tried their products yet, I'll definitely be looking for them next time I'm at the store. Clicking on the link above also gives me (and you) a $3 coupon for a Whitney Farms product. Their products are 100% natural with no additives and nothing artificial. I'm not sure I could go wrong with that concept. Plus, those same gardening circles who told me to jump in a lake with my fertilizer question (maybe they're a little pretentious) have *nothing* nice to say about many potting soils, including the Miracle Gro brand. Apparently, many potting soils have very junky ingredients that aren't helpful for plants at all. Who knew? Maybe that's why I have so many planters that look *awful* by the end of the summer? Maybe an organic soil would pass muster? But first things first. In order to eventually get some new shrubs and trees into our yard, I need to do some more transplanting of the smaller plants currently in the way. A little organic plant food would probably go a long way in helping them re-establish in their new locations, and it would be the perfect opportunity to test it out. So pardon my dust while I go print off my $3 coupon and chase the neighbor's dog out of our backyard. I've got some plants to move! 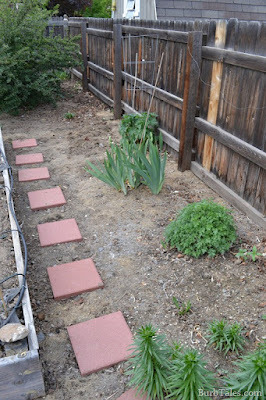 You can either put some wire just under the soil at the fence line or use brick, rocks or blocks, either at the fence line or bury them just under the soil. They can be solid or broken. That will keep the dog from digging through. Hope this helps. Thanks for your suggestion Karen. I'm tempted to be a really squeaky wheel with the neighbors to get them to pay a little more attention to where their dog is...but we may have to resort to some work on our side too. Le sigh. I hate to be a stickler, but keeping someone else' dog *in their backyard* really shouldn't be our problem. Lol Katie you crack me up. Online forums bug me to no end because people just have no filter! I would love to meet some of these people in real life and see how they behave. Shocking really. Anyways, I have no real input for you, other than I love your blog and have always especially loved your garden posts and how you keep it real. Good luck with the dog and your new 'plant food'. And thanks for the coupon, I'm definitely going to try some out! !